Using its geographical advantage, Cyprus has quickly positioned itself as a true financial hub and professional services centre. In turn, it has become an ideal gateway and platform for conducting business and investments to Europe (EU and non-EU such as Eastern Europe, Russia and CIS), as well as neighbouring markets in the Middle East and North Africa. Indeed, it is not only physical proximity that is a benefit, but close historical and cultural connections to all these regions, therefore an excellent grasp of business practices, understandings and relations – geographically, Cyprus is at the crossroads of these regions, so naturally it has had ongoing connections and communication throughout history. This then makes Cyprus a much more attractive location for professional services and investments, able to combine both offshore and onshore business activities. 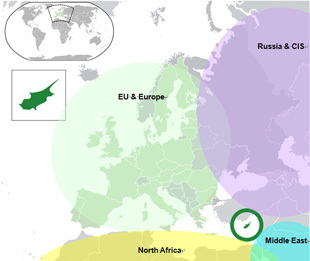 Throughout history, Cyprus has been a stepping stone between Europe and Asia, Middle East and Africa. In the modern world, Cyprus has become the ideal gateway for business activities and investments to the region; European Union, Eastern Europe, Russia, CIS, Middle East and Africa. Located in the eastern Mediterranean at the crossroads of Europe, the Middle East-Asia and Africa, Cyprus has for centuries been a strategic stepping stone and trading partner for major world powers, such as the Golden Age of Greece, Roman Empire, British, Byzantium, Frankish, Venetian, and Ottoman. Other nearby nations have also been in close communication and interaction, such as the Egyptians, Phoenicians, Persians and Arabians. Naturally, this has left a lasting legacy on the country in terms of historical and cultural influence. At the same time, the local Cypriot people had little choice but to greet each foreign visitor with an open mind; flexibility, tolerance and generosity. Over the many years, this has transformed into an insatiable appetite for business, trade and tourism-hospitality. In many ways, this provides the foundation for its modern position as a financial, professional services and investment business hub.